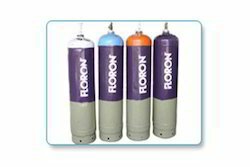 Leading Manufacturer of refrigerant gases from Nagpur. Acclaimed as the market leader, it feels ecstatic to offer you Refrigerant gases. Aimed to extrude your search for a quality net of its type, it is widely acclaimed by our clients.We offer these gases in properly manufactured cylinders & tanks that are leakage free and can easily be transported. Looking for Refrigerant Gases ?